Ok my gorgeous beauty readers, it's time for a great giveaway! 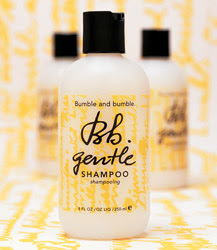 Have you tried Bumble and Bumble products? They are my favorite haircare line, and it's one of the only things I use on my hair to protect my color and give my hair a good shine. Right now I'm currenty using the Bumble and Bumble Shine Collection on my hair, and I've been loving it! I'm also excited that Bumble & Bumble is now sold at Sephora, making it easier to grab up your favorite products. You can also purchase B & B at the Pittsburgh Salon, which is a complete wellness salon focused on many different ways for you to stay beautiful and fit. Right now, courtesy of Pittsburgh Salon, we are giving away a Shampoo & Conditioner Set (valued at over $50) to one lucky Bella's Beauty Spot reader! Good luck! Giveaway will conclude 9/3/2011. Giveaway will conclude 9/3/2011. Open to the US only. Winner will be chosen by random.org and will have 48 hours to respond to the winning email. If the winner does not respond, another winner will be chosen. No Po Boxes please. Cheaters will be disqualified. Glad I won, just posted to my facebook! Thanks!